It's Wednesday, it's spring, and this is the first newsletter of the year to be assembled while sitting outside. Once the sun goes down and it gets dark, it'll be time to go inside and see some music. 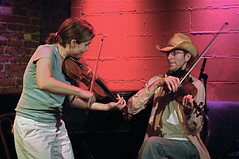 Will Scott and Wylie Wirth will be at the 68 Jay St Bar tonight (you have to figure out the address on your own) and Franglais will be playing a set of gypsy jazz at Bar Reis in Park Slope, followed by what is said to be the only weekly gypsy jazz jam in the city. Last week they had a push-up contest so get your biceps over there. Or, for more traditional jamming, head to the Baggott where the Sheriff will be presiding. Also tonight, Reckon So is at the Rodeo Bar. 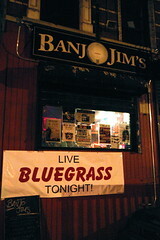 Thursday night is the CashHank, while Monica "Li'l Mo" Passin will be at Banjo Jim's and Vincent Cross at Hill Country. Friday night is another "What to do? What to do?" night with a heck of a triple bill at Jalopy: John Pinamonti, the Woes, and the Jug Addicts, while Hogzilla plays at Sunny's. On Saturday Andy Mullen will be playing his old-time flavored originals at Pete's Candy Store, with Roger Grossman on bass, Kari Denis on fiddle, and me on harmonica. Andy writes great songs and I'm looking forward to it. Meanwhile Vincent Cross and Good Company, featuring Good Companion Jonah Bruno on banjo, will be playing in Long Island City. We'll be picking as usual at Kili on Sunday, as will Tony at Paddy Reilly's, and if you can't keep up with Tony, you can go to the Paddy Reilly's slow jam on Monday night. See the calendar for the latest details. Pat Conte and Bob Guida, who together have for decades been known as The Otis Brothers, a legendary old-time blues duo, got together last night to celebrate a showing of Pat's artwork at Jalopy. It was a reunion of old friends, a night of sometimes loose but always amazing music. Pat played solo to start off, doing some fabulous old fiddle tunes, then called up a number of folks who joined him for a few tunes each, and then Bob came up and they did a range of blues and gospel and old-time, with several special guests, including Citizen Kafka, who took the stage to play bass, starting off on Jalopy owner Geoff's homemade washtub bass, and then moving to electric. 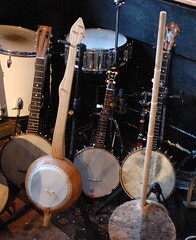 When the Otis Brothers concluded, Bob Jones came up to join Citizen Kafka for a pared-down reunion of the Wretched Refuse String Band, featuring their typical insanity, ranging from surprise fiddle tunes to a rendition of "She's Coming Round the Mountain" that involved beluga (and a stolen German Luger) to Samuel Taylor Coleridge's little-known version of "Red Wing." During the Otis Brothers' set, Bob Guida gave Pat's mother, Rose, a shout-out. "All this music you're hearing, she heard every day, in every room of her house," he said. "We made an album in her kitchen. She made us meatballs. We recorded the album in a day and then we ate all the meatballs." See the complete set of photos. Dock Oscar, cool Opry-ator, filled up Freddy's as usual on the third Thursday last night. I missed most of the song circle, but Dock's Ambassadors Of Love did the first full set, wrapping up with bluegrass covers of Abba's "SOS" and Morrissey's "Please Please Let Me Get What I Want." I think we should organize an evening of 80s bluegrass covers! Korby Lenker, a Seattle songwriter by way of Nashville, played an extremely energetic short set, concluding by breaking a string, but not before giving us some unique originals. See the rest of the photos. Read more below, or see the complete set of photos. I'm playing Tony Trischka's "Double Banjo Bluegrass Spectacular" album as I write, in preparation for the five-string festivities at Banjo Jim's tonight. It looks to be not only an entertaining but an educational evening, especially with Shlomo no doubt already packing a moving van with examples of every step in the instrument's evolution over the century. The (extensive, this year) pain of tax day was greatly alleviated by the Second Fiddles' Roots and Blues evening at the Living Room, featuring guitarist Del Rey, about whom I wrote last week, and blues mandolin player Rich Del Grosso. Del Rey's set largely overlapped that of Friday's show, but with Fiddles Jon Vesey and Guillaume Guissault to back her up on banjo and guitar, she did a few songs on the ukelele. Uke players don't make faces like that every day, but she had good reason to. Wearing a dress that seemed almost to have been chosen to match the decor, she was alternately humorous, engaging and astonishing. At one point she made a very interesting casual remark, as she was playing a somewhat absurd 1920s blues tune, noting that at the same time this music was popular, so were cubism and surrealism. We too often have a habit of thinking of 1920s and 1930s blues as somehow "simpler" or "rootsier" when in fact, the atmosphere then was probably more adventurous and culturally rich than it is now. Rich Del Grosso took us on a tour through the under-reported history of blues mandolin, playing tunes by Yank Rachell, Johnny Young and other players, and for one song picking up the guitar and picking the hell out of it, alternating delicate riffs on the high strings with aggressive bass snaps. "It sounds like he's beating up the guitar and then apologizing to it," said a friend who joined me for the show after my endless raving about Del Rey last week. It was an outstanding evening, and I'm sorry I couldn't stay late enough to catch Blue Harvest's midnight set. 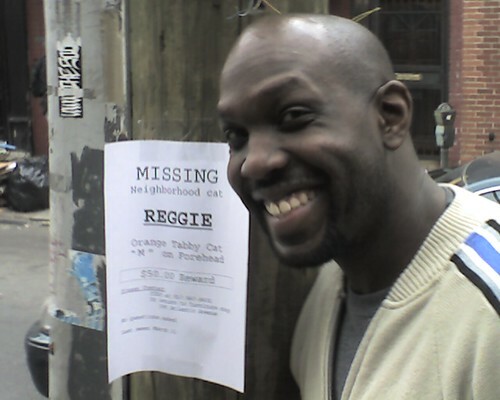 "I Once Was Lost, But Now Am Found..."
Rumors of Reggie's disappearance were greatly exaggerated, as shown by this photo taken outside Kili on Sunday. He was very much in evidence, holding down the not-exactly-old-time jam on bass. With Doug Hatt and Fresh Baked last night, I had the strange privilege of playing a set following Kenny Kosek. His was a short set, but he was of course cooking on the fiddle, along with Jon Sholle on guitar and Dave Thompson, an extraordinary bluegrass vocalist. Our set went well, a fitting celebration for Doug's birthday and the third anniversary of the band. We went to see Del Rey at the Good Coffeehouse on Friday night, which has to be one of the single best concert venues in the city. A gorgeous room that sounds beautiful, an eclectic roster of performers, and an intimate setting. Del Rey is billed as a fingerstyle blues guitar player, but she's a lot more than that. Her guitar playing is well beyond the basic blues techniques, with intricate moving bass lines, incomprehensible (to me, at least) chords and unexpected changes. Her repertoire extends from classic blues to Louis Jordan to 20s and 30s bawdy-house jazz tunes. At one point she performed, alone, a guitar duet that Memphis Minnie and Kansas Joe used to do. While she doesn't make a big deal of it, she writes a lot of originals and puts new and pointed lyrics to songs like "Mississippi River Blues," ("Mister mister, hurry call up Washington, tell 'em Louisiana about to drown / You know I can't get no answer telephoning Mr. Brown / The President sure don't treat me right / You can't get no good assistance unless you're rich and white") or crafting instrumentals that take wildly unexpected turns. The best way I can think to describe her is a meeting of Gary Davis and Richard Thompson. She's a great personality, too, standing up there alone with a parlor-sized steel resonator, laughing, commenting on her own solos, standing up on her tip-toes and throwing her head back. "I saw something reassuring today while I was walking around Manhattan," she said after the first song. "A genuine crazy person, talking to himself, and he wasn't on a cell phone." The room burst out laughing and she shook her head. "It used to be, you could tell." She's playing again on Tuesday night at the Living Room, in an evening of blues organized by the Second Fiddles. 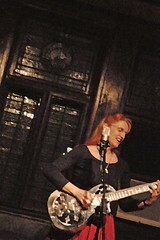 (Jon Vesey, of that band, was in the audience, as were Parrish Ellis, Mamie Minch, and enough guitar players that Del Rey said she was "tuning her guitar more than I'd do for the regular folks.") Blues mandolin player Rich Delgrosso is also on the bill, as are Blue Harvest, so that will be a great way to forget your taxation blues. The Pickin' Party is on as usual at Kili Sunday, but I'll be hosting it this week with Kari Denis, and we'll be playing old-time style, with some beautiful tunes and songs. Come on down and bring some songs to learn, or sit with us and learn some new old songs. We'll have some music to work from if that makes you more comfortable and we won't be going too fast. Last night at Sunny's was another intersection of musical worlds. 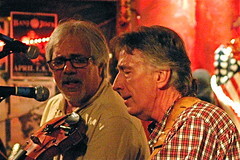 Half-Baked Beans, which as John Pinamonti said, "is what happens when two Mud Brothers need some other folks to play with," did a set of old-time music, sitting in a circle up front, completely tuned into each other, leaning and listening, oblivious to everyone and everything but the tune. The rhythm section -- Charlie Shaw and Peter Kohman -- took a brief break, then got back up behind John, Charlie switching to drums from guitar. John's set was rockin as usual, with Rod Hohl on Strat, and I was glad to sit in with them on a few songs. John will be at Jalopy on April 25, and the complete Mud Brothers are playing tonight at the Living Room LOUNGE, 245 23rd St. in Brooklyn (between 5th and 6th Ave, closer to 5th), from about 8-10. View the complete set of photos. It's the weekend already, isn't it? And about time! Enough time-wasting at work! Time to get out and get serious about seeing some music. Start tonight -- as usual you have your choice of things to do. 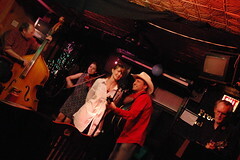 Sunny's tonight starts with old-time, with the Half-Baked Beans String Band at 8:30. That's Nate Rowan, Kari Denis, Joel Wennerstrom, Charlie Shaw and Peter Kohman. 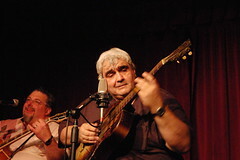 Charlie and Peter will then change instruments and genres, and play with John Pinamonti who goes on at 10. You've also got Blue Harvest at Googies, a great Roots&Blues Roundup at Jalopy with the Second Fiddles, the Cangelosi Cards, and the Cheatin' Hearts, and Alex's Whisky Rebellion at Banjo Jim's. On to Saturday! Adam Levy's first Bluegrass Saturday Night hits Banjo Jim's with a series of great bands including The Eversole Family Band, Vincent Cross, and Kings County Strings, Brad Einhorn's new band. All Night Cooking wraps it up at 10:30 with two sets. Meanwhile back on our side of the river James Reams barnstorms Jalopy and the Mud Brothers play the Living Room Lounge in Brooklyn (NOT the LES Living Room). Monday during the day you can rest at work, then get over to the Parkside to see the Sheriff's Cheatin' Hearts followed by Michael Daves' bluegrass jam. Michael Daves is at Rockwood as usual on Tuesday night, and Fresh Baked is at Abilene. A word on some jam changes. The Saturday jam in Williamsburg is no longer happening, we're told by Stan Baum. The folks running it lost their lease and moved back home. Also no longer happening is Anina's First Friday jam -- it's either dead, or in a coma, but either way it won't be happening tonight. 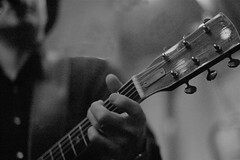 The Pickin' Party will happen as usual at Kili on Sunday. If the venue changes we'll let everyone know at least a week in advance. See the updated calendar here. Please let us know what's going on so we can feature it here. Send your gig notices, myspace bulletins, facebook posts and carrier pigeons to pickin@ponkiesburg.com by Wednesday for inclusion. 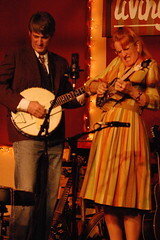 Kari and Rob did a great duo set at Rockwood last night, playing old-time and bluegrass and Irish tunes. Kari has brought so many great new tunes to the jam scene, and we got to hear a lot of them, supported by Rob's astonishing rhythm playing and harmonies and improvisation. Walt Wells was wonderful as always on bass, and Will Martina contributed some beautiful cello playing for the fall string-quartet effect.